Lavender, S.J. 2017. Chapter 10: Remote sensing. In: Uncles, R. and Mitchell, S. (Eds.) Estuarine and Coastal Hydrography and Sediment Transport, Cambridge University Press. Cristina, S., Cordeiro, C., Lavender, S., Costa Goela, P., Icely, J., and Newton, A. 2016. MERIS Phytoplankton Time Series Products from the SW Iberian Peninsula (Sagres) Using Seasonal-Trend Decomposition Based on Loess, Remote Sens. 8(6), DOI: 10.3390/rs8060449. Kratzer, S., Alikas, K., Harvey, T., Morozov, E., Mustapha, S.B., and Lavender, S. 2016. 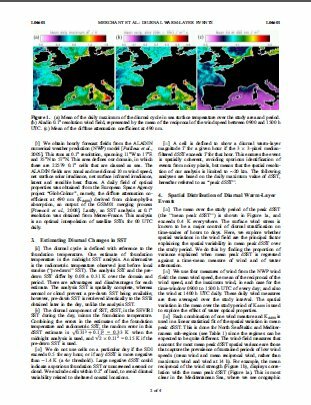 Chapter 19: Multi-temporal remote sensing of coastal waters. In: Ban, Y. (Ed.). Multitemporal analysis of satellite images. Springer-Verlag Berlin Heidelberg. Lavender, S., Boissier, E., Brito, F., Ribeiro, R., Aas, C., Casu, F., Iapaolo, M. 2016. E-Collaboration for Earth Observation: Example Challenge Focused on the Atmospheric Correction of Ocean Colour Data. ESA Living Planet Symposium, Prague, Czech Republic, May 2016. Lavender, S., Haria, K., Cooksley, G., Farman, A. and Beaton, B. 2016. 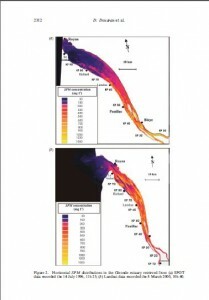 Understanding the Future Market for NovaSAR-S Flood Mapping Products using Data Mining and Simulation. ESA Living Planet Symposium, Prague, Czech Republic, May 2016. Lavender, A. and Lavender, S.J. 2015. Practical Handbook of Remote Sensing. CRC Press, Taylor & Francis Group. Gascon, F., Biasutti, R., Ferrara, R., Fischer, P., Galli, L., Hoersch, B., Hopkins, S., Jackson, J., Lavender, S., Mica, S., Northrop, A., Paciucci, A., Paul, F., Pinori, S. and Saunier, S. 2014. European Space Agency (ESA) Landsat MSS/TM/ETM+ Archive Bulk-Processing: Processor Improvements and Data Quality, SPIE Optical Engineering and Applications, San Diego, United States, August 2014. Lavender, S.J. 2014. 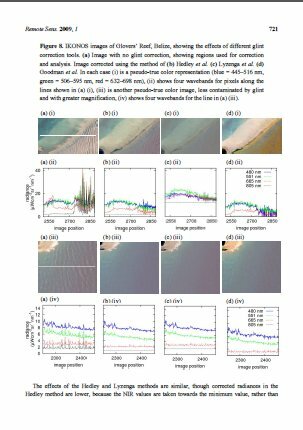 Multi-sensor ocean colour atmospheric correction for time-series data: Application to LANDSAT ETM+ and OLI data, EARSeL eProceedings, 13(2): 58-66. Lavender, S.J. and Moufaddal, W. 2014. Chapter 23: Remote Sensing Applications to Modeling Biomass and Carbon of Oceanic Ecosystems. In: Wang, G. and Weng, Q. (Eds.) Remote Sensing of Natural Resources (Remote Sensing Applications Series), CRC Press, Taylor & Francis Group. Font J., Boutin, J., Reul, N., Spurgeon, P., Ballabrera-Poy, J., Chuprin, A., Gabarró, C., Gourrion, J., Guimbard, S., Hénocq, C., Lavender, S., Martin, N., Martínez, J., McCulloch, M., Meirold-Mautner, I., Mugerin, C., Petitcolin, F., Portabella, M., Sabia, R., Talone, M., Tenerelli, J., Turiel, A., Vergely, J.L, Waldteufel, P., Yin, X., Zine, S. and Delwart, S. 2013. SMOS first data analysis for sea surface salinity determination. International Journal of Remote Sensing, 34(9-10), 3654-3670. Kay, S., Hedley, J., and Lavender, S.2013. Sun glint estimation in marine satellite images: a comparison of results from calculation and radiative transfer modelling. Appl. Opt. 52, 5631-5639. Werdell, P., Franz, B., Bailey, S., Feldman, G., Boss, E., Brando, V., Dowell, M., Hirata, T., Lavender, S., Lee, Z., Loisel, H., Maritorena, S., Mélin, F., Moore, T., Smyth, T., Antoine, D., Devred, E., d’Andon, O. and Mangin, A. 2013. 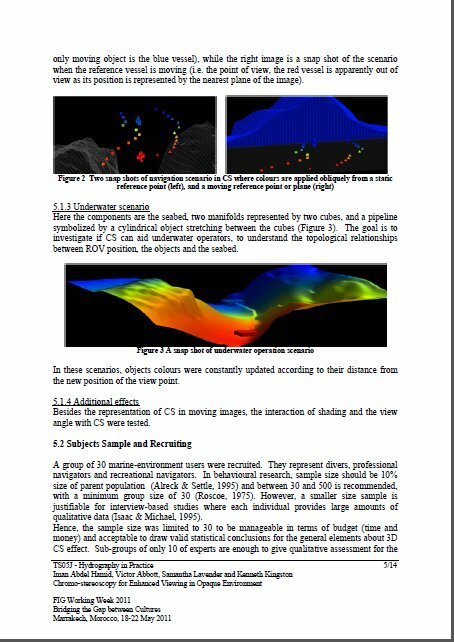 Generalized ocean color inversion model for retrieving marine inherent optical properties, Appl. Opt. 52, pp. 2019-2037. Lavender, S., Fanton d’Andon, O., Kay, S., Bourg, L., Emsley, S., Gilles, N., Nightingale, T., Quast, R., Bates, M., Storm, T., Hedley, J., Knul, M., Sotis, G., Nasir-Habeeb, R., Goryl, P. and Sentinel-3 L2 Products and Algorithm Team. 2012. Applying Uncertainties to Ocean Colour Data. Metrologia, 49, pp. S17–S20 doi:10.1088/0026-1394/49/2/S17. Abdel Hamid, I., Abbott, V., Lavender, S. and Kingston, K. 2011. Chromo-stereoscopy for Enhanced Viewing in Opaque Environment. FIG Working Week 2011: Bridging the Gap between Cultures, Marrakech, Morocco, May 2011, 14 pp. Brewin, R.J.W, Devred, E., Sathyendranath, S., Lavender, S.J, and Hardman-Mountford, N.J. 2011. Brewin, RJW., Hirata, T., Hardman-Mountford, N.J., Lavender, S.J., Sathyendranath, S., Barlow, R. In Press. The influence of the Indian Ocean Dipole on interannual variations in phytoplankton size structure as revealed by Earth Observation, Deep-Sea Research II. Lavender, S.J. et al. 2010. Products Definition and Determining Uncertainties; Sentinel-3 Optical Level 2 Prototype Processor. ESA Living Planet Symposium, Bergen, Norway, June-July 2010, 5 pp. Lavender, S. 2009. Chapter 27: Lavender S, 2009. Optical Remote Sensing of the Hydrosphere: From the Open Ocean to Inland Waters. The SAGE Handbook of Remote Sensing , Warner,T; Dunane Nellis, M; Foody, G (eds. ), 504 pp. Lavender, S.J., Moufaddal, W.M. and Pradhan, Y.D. 2009. Assessment of temporal shifts of chlorophyll levels in the Egyptian Mediterranean shelf and satellite detection of the Nile bloom. Egyptian Journal of Aquatic Research, 35(2), pp. 121-135. Kay, S., Hedley, J.D., Lavender, S. 2009. Sun Glint Correction of High and Low Spatial Resolution Images of Aquatic Scenes: a Review of Methods for Visible and Near-Infrared Wavelengths. Remote Sensing, 1, pp. 697-730. Davey, F., Lavender, S., Martin, J. and Teverson, R. 2008. A Critical Review of Geospatial Techniques for Landscape Character Assessment. RSPSoc 2008: Measuring change in the Earth system, 4 pp. Hoepffner, Wilson and Lavender. 2008. Chapter 10, Ocean Colour and Climate Change. Platt, T., Hoepffner, N., Stuart, V. and Brown, C. (eds. ), Why Ocean Colour? The Societal Benefits of Ocean-Colour Technology, No. 7, IOCCG, Dartmouth, Canada. Lavender, S., Raitsos, D. and Pradhan, Y. 2008. Chapter 8: The seasonal and longer term variations in the phytoplankton of the North Eastern Atlantic Ocean: from the Irish Sea to Bay of Biscay. Remote Sensing of the European Seas, Barale, Vittorio; Gade, Martin (Eds. ), 514 pp. Merchant, C.J., Filipiak, M.J., Le Borgne, P., Roquet, H., Autret, E., Piollé, J.-F., Lavender, S. (2008) Diurnal warm-layer events in the western Mediterranean and European Shelf Seas. Geophysical Research Letters, 35, doi:10.1029/2007GL033071. Raitsos, D.E., Lavender, S.J., Maravelias, C.D., Haralambous, J., Richardson, A.J. and Reid, P.C. 2008. Identifying phytoplankton functional groups from space: an ecological approach. Limnology and Oceanology, 53, 2, pp. 605–613. Aiken, J. Fishwick, J.R., Lavender, S.J., Barlow, R., Moore, G.F., Sessions, H., Bernard, S., Ras, J. & Hardman-Mountford, N.J. 2007. Validation of MERIS reflectance and chlorophyll during the BENCAL cruise October, 2002: preliminary validation and new products for phytoplankton functional types and photosynthetic parameters. 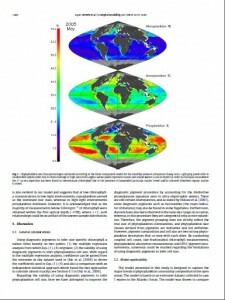 International Journal of Remote Sensing, 28, 3-4, pp. 497-516. McQuatters-Gollop, A., Raitsos, D.E., Edwards, M., Pradhan, Y. Mee, L.D. and Lavender, S.J. and Attrill, M.J. 2007. A new long-term chlorophyll dataset reveals a regime shift in North Sea phytoplankton biomass unconnected to nutrient levels. Limnology and Oceanology, 52, 2, pp. 635–648. Pinnock, S., Fanton d’Andon, O. and Lavender, S. 2007. Globcolour – A Precursor to the GMES Marine Core Service Ocean Colour Thematic Assembly Centre. ESA Bulletin 132, November 2007. Doxaran, D., Castaing, P. and Lavender, S.J. 2006. Monitoring the maximum turbidity zone and detecting fine-scale turbidity features in the Gironde estuary using high spatial resolution satellite sensor (SPOT HRV, Landsat ETM+) data. International Journal of Remote Sensing, 27, 11, pp. 2303-2321. Doxaran, D., Cherukuru, R.C.N. and Lavender, S.J. 2006. Apparent and Inherent Optical Properties of Turbid Estuarine Waters: Measurements, Empirical Quantification Relationships and Modelling. Applied Optics, 45, pp. 2310-2324. Pradhan, Y., Lavender, S.J., Hardman-Mountford, N.J. and Aiken, J. 2006. Seasonal and inter-annual variability of chlorophyll-a concentration in the Mauritanian upwelling: Observation of an anomalous event during 1998-1999. AMT Deep-Sea Research II Special Issue, 53, pp. 1548-1559. Pinkerton, M.H., Moore, G.F., Lavender, S.J., Gall, M.P., Oubelkheir, K., Richardson, K.M., Boyd, P.W. and Aiken, J. 2006. A method for estimating inherent optical properties of New Zealand continental shelf waters from satellite ocean colour measurements. New Zealand Journal of Marine and Freshwater Research, 40, pp 227–247. Raitsos, D.E., Lavender, S.J., Pradhan, Y., Tyrrell, T., Reid, P.C. and Edwards, M. 2006. Coccolithophore bloom size variation in response to the regional environment of the subarctic North Atlantic. Limnology and Oceanography, 51, pp 2122-2130.